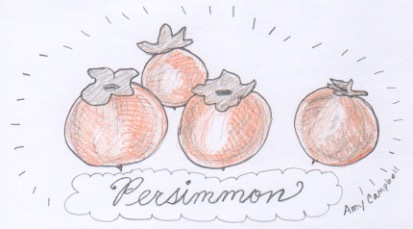 The wild Persimmon - Biological facts, winter weather predicting, recipes. “The Wild Persimmon of Appalachia” (Diospyros virginiana) - Biology of with Charlie Kwit , Winter weather predictions using Persimmon seed with Crystal Wilson, Persimmon Bread recipe with Mary Constantine (Food Writer for the Knoxville News Sentinel), and the excitement of receiving a 50 lb. bag of Kennebec potatoes from a friend with Jill Sauceman. The wild persimmon of Appalcahia (Diospyros virginiana). Illustration here by Amy Campbell. Cross section of a persimmon.